First of all, if you haven’t seen 2001 or Contact already, then you should rectify that immediately! They’re both excellent, and Interstellar was made with many connections and homages to them…so turn off your computer or tablet or brain implant or whatever you’re reading this with, and go check out those movies! You can come back to this blog later. Also, if you’re interested in checking out other astronomers’ responses to the movie, you can read the excessively critical review and mea culpa by Phil Plait, the interesting tweets and more tweets by Neil deGrasse Tyson, and this article in Wired magazine by Adam Rogers (and thanks to Lynne Friedmann for giving it to me). 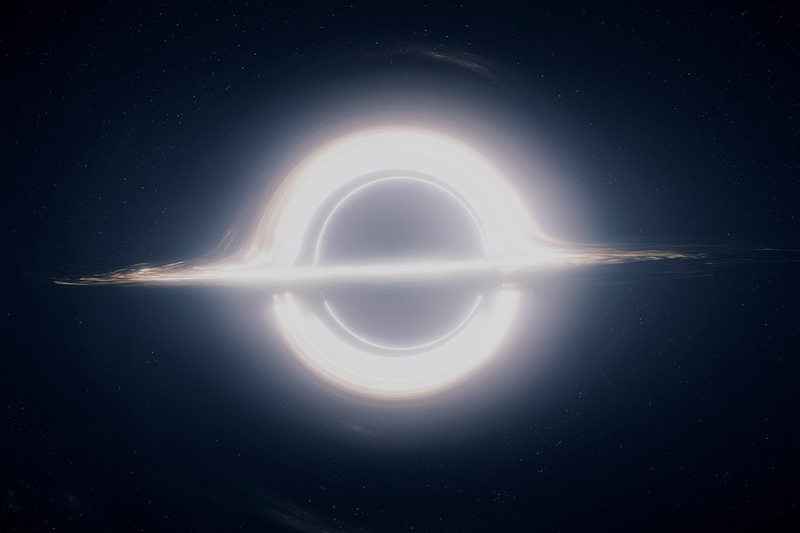 Why are astrophysicists discussing or questioning some aspects of the film? It’s because the filmmakers consulted Kip Thorne and did attempt to get the physics right, and because it’s the big space movie of the year, like Gravity was last year. In my opinion, they did do a pretty good job on many issues, though I wasn’t so sure about a couple others: for example, I’m not sure whether all the time dilation effects were calculated accurately (though their take on the “twin paradox” was interesting), and I’m skeptical about Matt McConaughey’s character’s experience in the black hole (which is the circular saw-shaped image above). And deGrasse Tyson made an accurate and important observation that bothered me too: “Mysteries of #Interstellar: Stars vastly outnumber Black Holes. Why is the best Earthlike planet one that orbits a Black Hole”? I’m not going to get into these physics issues much here. (I’m happy to try to answer any questions you might have though—just post a comment or contact me on Twitter.) Instead, I’m more interested in exploring questions the movie raised. For example, how much of a priority is space exploration to us as a society? How difficult would it be to find another potentially habitable planet—and what are our criteria for “potentially habitable”? How would we traverse these great distances? How do we transport people (and necessary equipment and supplies) so that they can survive for long periods far from Earth—in spacecraft, space stations, or colonies? How vulnerable is our own planet and which vulnerabilities should we be trying to address? How might we eventually contact or even meet alien species, and what would we tell or ask them? Who would do the talking or asking? Will we behave with empathy or will we act like conquerors? What are own roles and responsibilities as Earthlings and citizens of the cosmos? It’s easy to become focused and fixated on short-term and local problems, as they can seem the most pressing. That’s totally understandable, but we as a society can’t forget the big long-term picture. What are our objectives and priorities as a global community? What do we want to achieve, and how can we work toward those goals and help future generations to realize them? In the movie, a runaway Dust Bowl—presumably due to climate change—or some kind of “nuclear winter” devastates the world’s food supplies. Though this might seem far-fetched, it’s not out of the question for our planet. People had to struggle just to get through each day and to feed their families, such that exploration was the furthest from their minds and people started believe that the Apollo program was a hoax. But the drive to explore the unknown and see what’s out there is an inherently human trait. Carl Sagan once wrote, “Exploration is in our nature. We began as wanderers, and we are wanderers still. We have lingered long enough on the shores of the cosmic ocean. We are ready at last to set sail for the stars.” What are other planets, solar systems, or even other galaxies like, and what do their differences tell us about our own? Just today a Scientific American article came out, where the author discusses the thousands of exoplanets observed so far and argues that “Planets More Habitable than Earth may be Common in Our Galaxy.” These are issues we can’t stop thinking about. One problem is that space is big. “Really big. You just won’t believe how vastly, hugely, mindbogglingly big it is” (to quote the Hitchhiker’s Guide to the Galaxy). Planets that support life are extremely rare, though we don’t know exactly how rare yet. It’s difficult to learn about planets far away, and it won’t be easy to find out which ones humans could visit or which ones might support alien life. Contacting those aliens is more complicated. And then visiting other planets and solar systems, or even setting up colonies on them is literally a multi-generational project. For example, Alpha Centauri is about 4.4 light years away. If astronauts could travel as fast as the Voyager spacecraft…it would take them 77,000 years to get there! They’d wake up from hibernation in their spaceship after all that time, and they wouldn’t even know whether other humans were still alive. Finally, one of the main points I think we should take away from the movie is that we must take care of our own planet. Earth is rare, and it’s our home. We face many dangers and threats throughout the world, including global warming, drought, floods, famine, air pollution, natural disasters, pandemics, ozone depletion, killer asteroids, and war. We should note that these problems and their effects are related to poverty and inequality too, and that’s not to mention threats to other species on Earth. We might not survive for thousands of years—which is like a blink of an eye for our universe—but we have to try. We have to work together and plan for the future. We are the local embodiment of a Cosmos grown to self-awareness. We have begun to contemplate our origins: starstuff pondering the stars; organized assemblages of ten billion billion billion atoms considering the evolution of atoms; tracing the long journey by which, here at least, consciousness arose. Our loyalties are to the species and the planet. We speak for Earth. Our obligation to survive is owed not just to ourselves but also to that Cosmos, ancient and vast, from which we spring. Contra what you “say,” the most interesting quandry raised by the movie is: why are Mat Mchon-a-hay and his grandkids mutually disinterested in meeting each other? When he walks in the room where his daughter is dying, the rest of his family just kind of walks away. It makes no sense. I agree, Keith, it makes no sense! For those of you with Science subscriptions, I recommend checking out this review of Interstellar and Kip Thorne’s book by Salman Hameed.